Kyoto is best tackled by train or bus. Buses are cheaper with day passes available but if you happen to be there during a national holiday there will be a lot of traffic. With my private photography tours, I often try to visit during weekdays and also try to avoid the crowds where possible. Below are some suggestions on when to visit and what sort of gear to take to each location. Tripods are hard to use in most public locations as there are crowds and you become a nuisance when setting up. Most private entry locations such as gardens and temples prohibit the use of tripods. Shooting handheld for most of the trip is the fastest way to get around. If there are at least four in your group a taxi is the quickest way to get around. I only took a Canon 50mm f/1.2 and a Zeiss 18mm f/3.5shooting with a Canon 5D Mark III. The five areas divided are Central, North, South, East, and West. Within each area are a few suggestions. 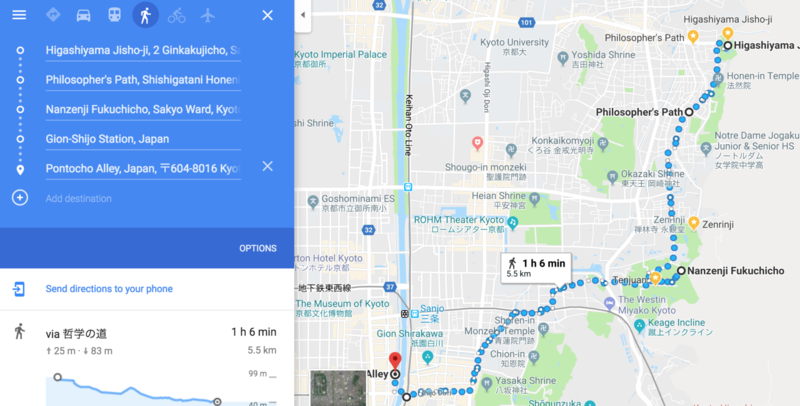 The above map route only takes an hour if you wish to explore the philosopher’s path during spring followed by the silver temple (Ginkakuji), Aqueduct (behind Nanzenji Temple), and finish off with a late afternoon to early evening stroll through Gion and Pontocho. Kyoto station is massive when you exit the main entrance it feels like being in a cocoon. A hyper-lapse or time-lapse up and down the escalators is a fun way to get a feel for the vastness of this station. The escalators seem to go up forever to about five-floor levels. The exterior of the station looks like a cruise ship. Late afternoon or early morning light looks cool in black and white. 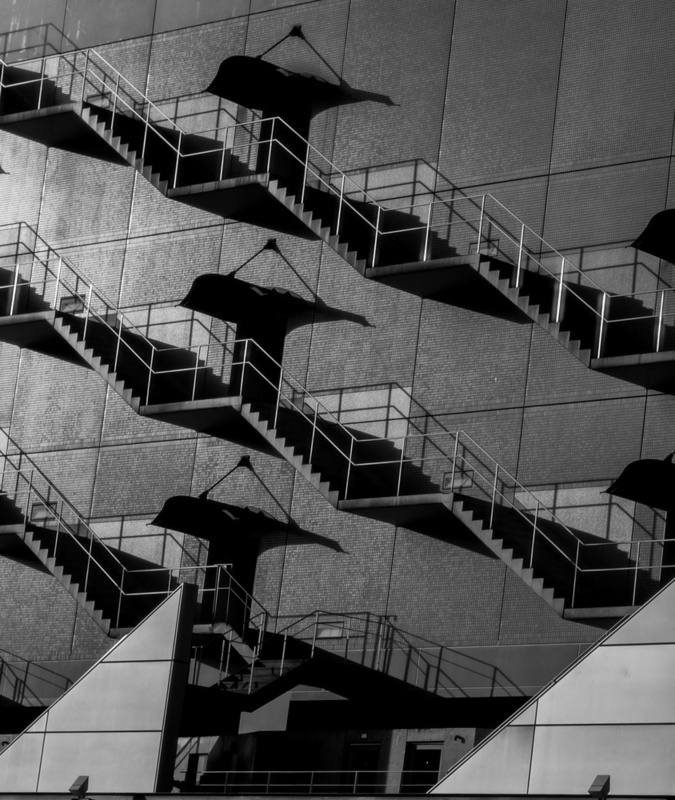 Kyoto Station is massive and filled with many architectural photography opportunities. 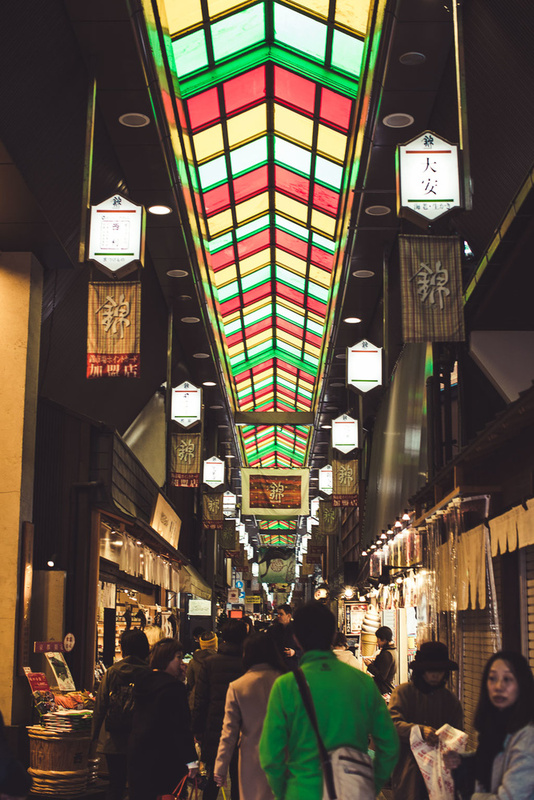 Nishiki Market is one ground level of about 1 kilometer of food stalls. It’s narrow and difficult to shoot in especially since everyone seems to be stopping to eat or take a photo. White balance can be tricky in some parts. The ambiance is electric and the diversity of food from all over Japan makes it worth a short look just before lunch. 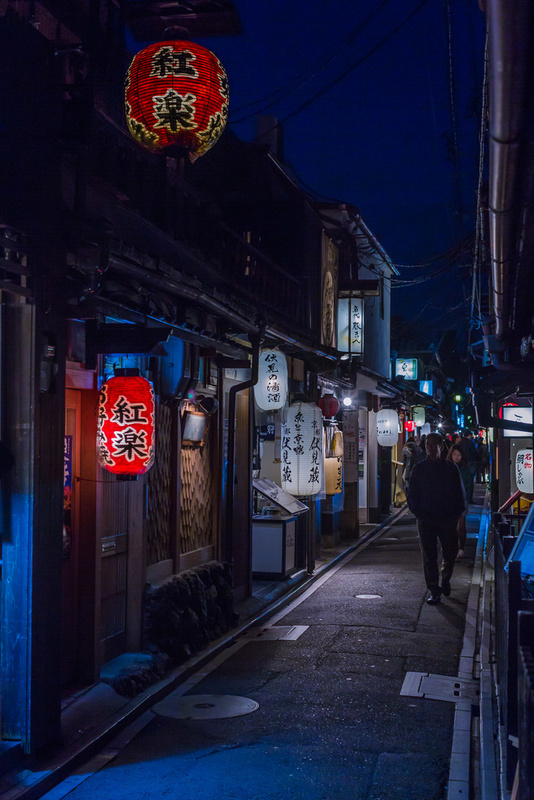 Lantern alley is my nickname for Pontocho. Once again, its narrow and crowded so be prepared to go shoulder to shoulder down two lanes at most. The area is riddled with restaurants and bars mostly catering for revelers and tourists. Shooting handheld at around 800–1,600 ISO at 1/60s on 50mm worked a treat on f/2.8. I would suggest coming here for dinner after walking through Gion area which is only across the river. 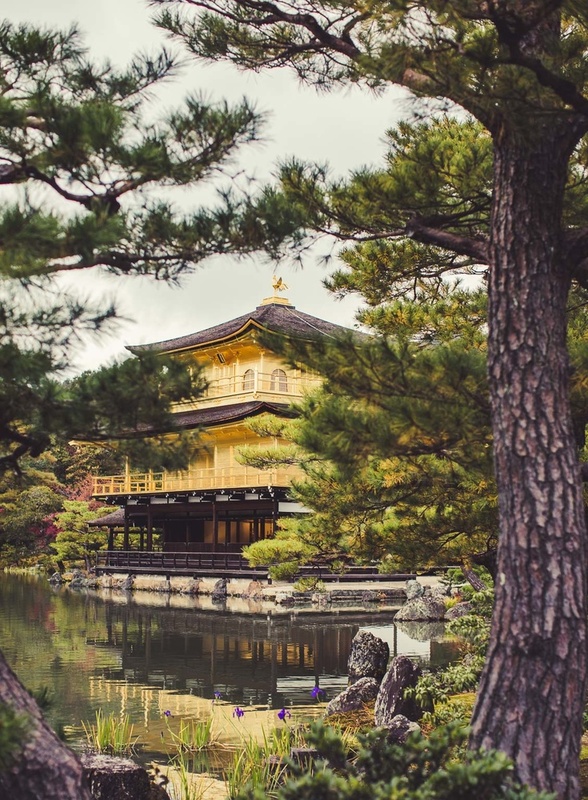 Kinkakuji, or the Golden Temple as it is known, like all other venues, requires a small entrance fee of about 400 yen. Traffic flow of people is controlled in one direction. The Golden Temple itself can’t be entered but many vantage points around the pond and garden path will make for great shots. 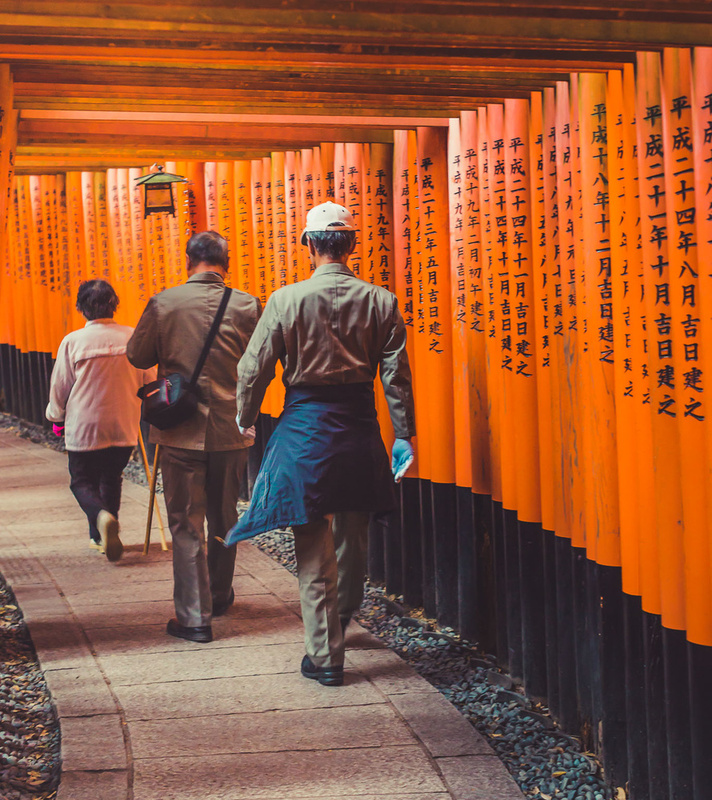 Just like the bamboo grove, Fushimi Inari is always open to public access. I would suggest you get here at about 7 a.m. If using a tripod make sure not to be in the way of other visitors. Japanese are too polite to say something and there are currently no restrictions here. However, I would suggest you shoot fast and move on as the crowds start to build up from around 7:30 a.m. Weekdays in most locations in winter or summer are easier to move about. This location has been voted by trip advisor as the most popular tourist destination in Japan. The torii gates along the entire trail are donations by individuals and companies, and you will find the donator’s name and the date of the donation inscribed on the back of each gate. The cost starts around 400,000 yen for a small sized gate and increases to over one million yen for a large gate. Trying to find a Geisha in Kyoto is becoming increasingly difficult. 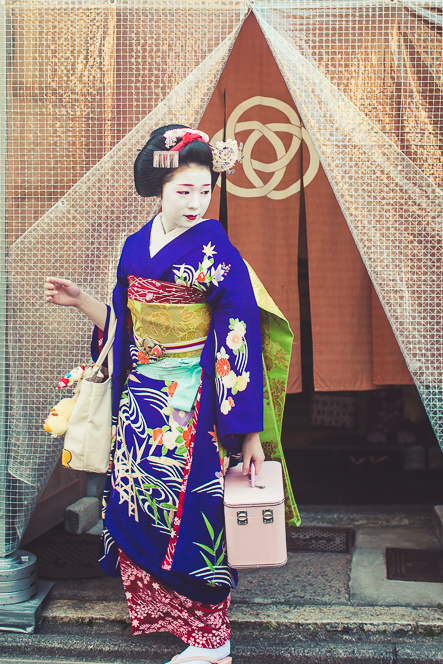 Geiko (Senior) or Maiko (Junior) as they are known in Kyoto are well aware of their popularity. They are treated like movie stars and us the tourists are the Paparazzi. 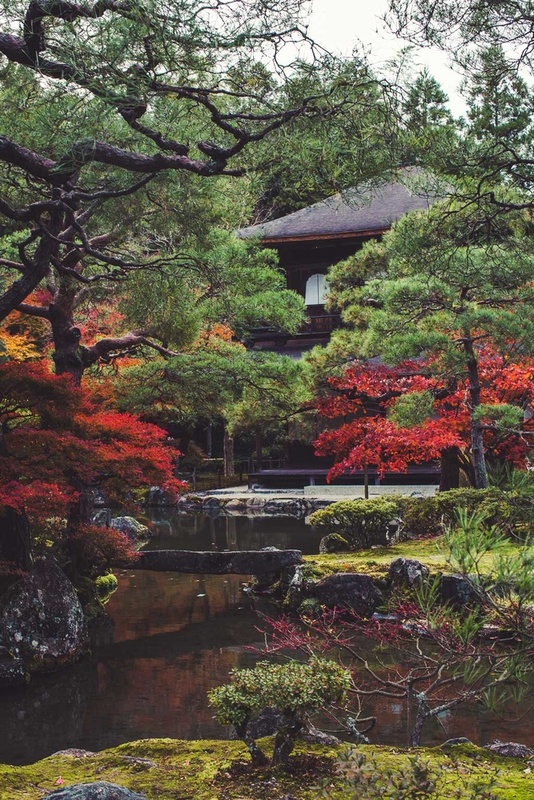 In my opinion, I think the silver (Ginkakuji) temple is more picturesque than the golden (Kinkakuji) temple which has more Wabi – Sabi best described as a perfect imperfection. 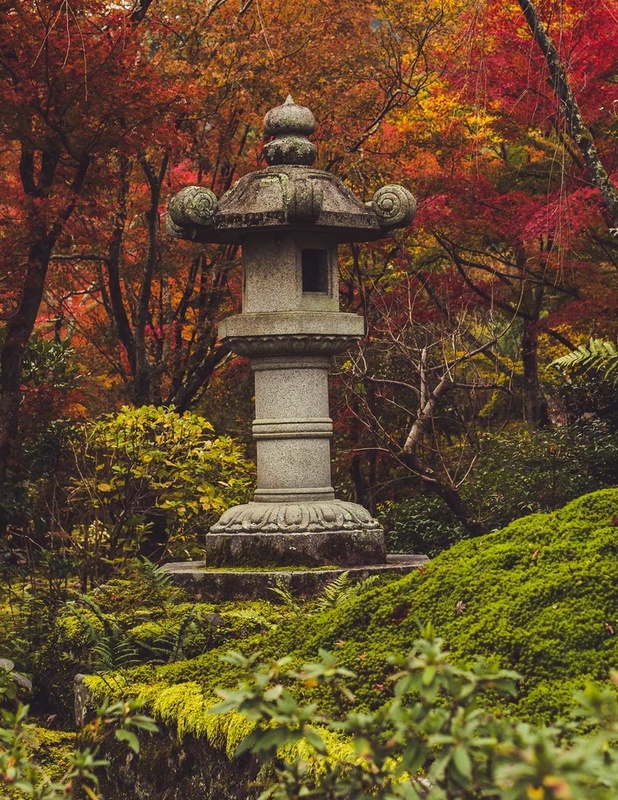 The mix of rock, sand, bridges, ponds, and perfectly positioned trees lends itself to a place where are artists can reflect on the finer aspects of Zen Buddhism. Tenryuji is a picturesque garden and temple with the focus more on the gardens especially in spring (cherry blossoms) or autumn (cypress trees). The gardens have a back entrance which is directly on the bamboo grove path which makes it very convenient to enter at 8:30 a.m.
Getting here at around 7:30 a.m. is important to avoid the crowds. 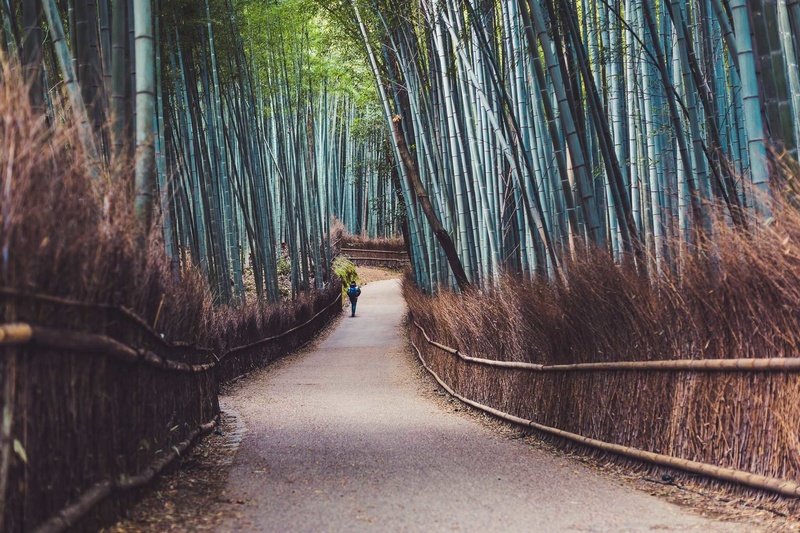 The bamboo grove pathway runs for only about 500 meters in key spots with curves or straight lines. Cars are allowed to drive through here so tripods might be in their way. Wedding shoots are done here on a regular basis and large tour groups also walk these paths. As usual, I expect lots of comments and questions sharing info and insights I may have missed.